Forum Index > Off-topic Talk > Lanze Spezzate: Demi lancers or full armored gendarmes? Posted: Wed 07 Feb, 2007 8:13 pm Post subject: Lanze Spezzate: Demi lancers or full armored gendarmes? First of all sorry for the silly title, but i was told that those Lanze Spezzate were Renaissance Italian Gendarmes or Condottieri who for any reason abandoned their unit (In the case of the Condottiero could be their leader´s lost too) and fight for any other country. But yesterday my friend told me that these guys weren´t really those ¨lone¨ heavy lancers but mercenary demi-lancers. As he is still defending till death the demi-lancers versions i ask you if you can bring me some light for the role of those guys. I don´t wont to bother you guys or wondering someone to investigate for me, but if you can help me with any historical info of these guys and their equipment i´ll be very grateful. Spezzare una lancia( to break a lance) = still today, a way of sayng to be faithful to somebody. In latemedieval times, lancespezzate were knights who by simbolically breaking a lance gave their fidelity to a lord, but the meaning was multiple: see this page with at least four meanings. \\\"La lancia spezzata riguarda l’uomo d’arme che passa agli stipendi di qualcuno individualmente e senza fare parte di alcuna compagnia. Si denominano, altresì, con questo nome anche alcuni cavalieri veterani che vengono impiegati direttamente dallo stato e sono organizzati in compagnie comandate da capitani. Lance spezzate divengono poi coloro che, avendo perso il cavallo, spezzano verso il calcio le loro lance per utilizzarle a piedi alla testa delle fanterie. Si chiama così anche ogni soldato che per coraggio e lealtà sia scelto a vegliare sulla persona del principe.\\\"
4) any soldier that by virtue of his loyalty and courage is chosen to watch on the prince. Since my Italian is not very accurate i´m not sure if this is included in the page, Do you know if XVI Century Condottieri cavalrymen used to wear surcoats or at least the waffenrock skirts worn over armour as used by French, Burgundian and Italian Gendarmes? Because i was told that they used to be noble men too. Surcoats? Probably so, but it would have been rare since there was an increasing tendency towards wearing the armor "white" (without covering). Waffenrocks were certainly possible, too, though by no means universal. The wearing of surcoats, jupons, or waffenrocks wasn't really related to whether the men were noble or not. Sometimes it was just a matter of fashion, sometimes it was done to identify with the unit (as opposed to displaying individual devices). I wish I can find that GIF scan of an old book's copy of a painting on an Italian rout. What irks me is that I can't remember the title, because if I do then I can prod somebody else on these boards to post up their (probably better) copies. This may help..Painting by Ucello.We can see many (at least 5 ) cavalry men wearing giorneas...Also Castagno painted some condotiers with giornea on white armour.. There were a lot of changes in armour clothing between 1490-1550, Could the white harness fashion lead to the tonlet skirted armours? I´ve seen some Renaissance paintings in wich cavalry is shown with white harness, Waffenrocks and surcoats (Gendarmes) and what truly caught my attention was seeing mounted men-at-arms with tonlet armours too. Can someone tell me if those armours were only for jousting or some kind of duel, or if they were mounted and foot combat armours? Yes, Michal, it's precisely that painting. Thanks a lot. Tonlets were probably used on the battlefield, but I'm not aware of them being used on horseback. Could you refer us to the illustration, Rodolfo? They might not exactly be showing tonlets but some sort of shorter thigh-defences that wouldn't have been unsuitable for horseback use. Mea culpa guys. The tonlet armour was actually a foot man-at-arms. Here´s the link of the battle of Orsha. Another good paint showing men-at-arms and their different clothes is the painting a escene of battle of the german painter Altdorfer (The battle of Alexander at Issus) i have it detailed in a book in wich some Gendarmes wear shorter tonlets while riding, other wearing wafenrocks, surcoats, etc. Sorry I´ll scan the book´s picture and will post in my next post. About white armours, Did them used mail skirts and coif too? 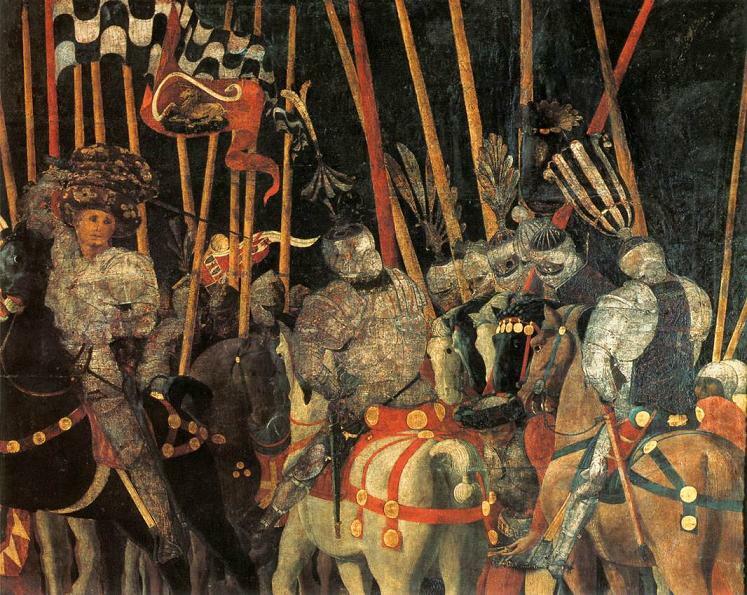 Paolo Uccello, the rout of San Romano (la rotta di San Romano, mainly known as "La battaglia di San Romano", the battle of San Romano). Surcoats are not present in renaissance italian art, I have seen a lot in my life, on he contrary armor is depictd carefully, as a symbol of knighthood. Piero della Francesca did paint some greatly detailed white armor (Pala di urbino, Milan, Academy of Brera), Giorgione da Castelfranco instead painted exquisite burnished and gilt armor (pala di San Liberale, Castelfranco Veneto). Three of the Mantova's armor from the Grazie's sanctuary were originally gilt (recent archival finding from Mantova, unpublished in english). Outside the early medieval period you don't find any surcoat anymore. I have some very detailed books with many illustrations of renaissance masterworks, but i have no digital materials to show, sorry. Yes, but maybe they didn´t used to paint surcoats or supravests, but i think that doesn´t say that they didn´t used the waffenrocks or whatever in the battlefield in the early or during the first half of the XVI century (I think that it´s like in the Museums, if you want to catch the attention to the armour, it´s better to show it white to let the viewer enjoy the art in the armour, please correct me if i´m wrong, despite in later years the fashion was wearing the white harness) . It seems that the French Gendarmes adopted the fashion Bases skirts from the Italian Gendarmes. Here is an extract of a Wikipedia article in wich Bases (Wafenrocks) and jerkins are used by italian armored heavy horsemen. Italian armoured cavalry had been wearing bases, with or without a jerkin or vest for the chest as well, since the late 15th century. It appears that French gendarmes picked up the fashion in their interventions in Italy during the Italian Wars. Adopted by the French sometime after 1495, the fashion soon spread throughout Europe, and may be seen in illustrations throughout the Italian Wars. Such bases were knee-length and cartridge-pleated. Such skirts eventually evolved into quilted or padded breeches worn in the early 17th century. ...at least that is what the article says, but i can´t confirm how much accurate the Wikipedia is. What happened to the horse armour of the painted Condottieri?! Hello everyone, as i promised this is a very little part of the Battle at Issus, i have an scaned bigger version, this is only a little part because of its size. The bigger one is not the full painting but it is the whole part of the cavalry. If anyone wants the other part i´ll send you via e-mail. A white harness means an armour without a mail skirt or that short cloth doublet worn under armour´s fauld? Do you know how common those mail skirt and doublet skirt defences were during XVI century? A "white" harness is a suit of armor that is neither blued/blackened nor covered in cloth. It's "white" because it shows the "white" metal in all its glory. What was worn under it doesn't matter--and in fact, many of them were designed to fit with a mail haubergeon in addition to a mail doublet inside. I take it that you're asking about the relative popularity of mail/cloth defenses that protruded beyond the faulds or tassets? As far as I know it was a matter of fashion. In the early 16th century--when there were many long-skirted coats and doublets in civilian wear--they were fairly common. But when doublet skirts grew shorter, they also went out of fashion except for cases where a buffcoat was worn under a short cuirass without faulds or tassets. 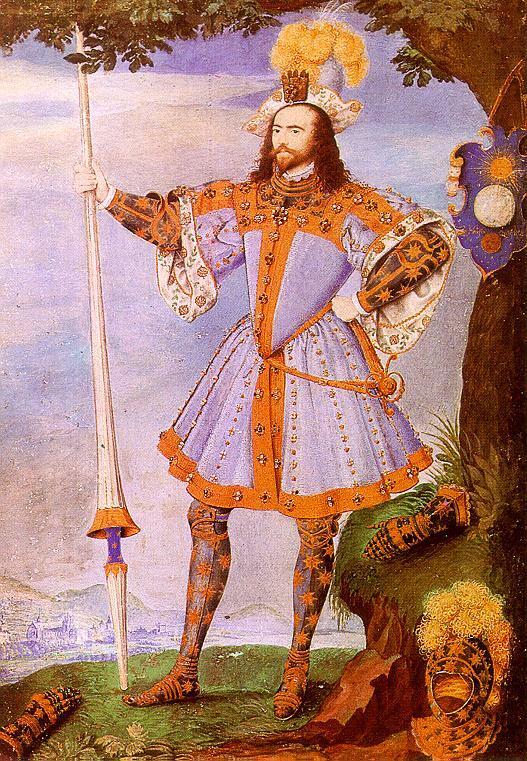 Since we've been discussing the popularity in various threads here of the garment variously known as a "based doublet", "waffenrock" and sometimes just "bases" as a covering for armour, this wonderful portrait of George Clifford, 3rd Earl of Cumberland must of course be included. This portrait by Nicholas Hilliard commemorates Lord George's ascention to the position of Queen's Champion, and his clothing in this may well be an attempt to harken back to "the good old days" of Henry VIII, etc. But it could just be that Clifford thought it was cool, too. In any event, it's the best known, and probably latest illustration, of such a garment. At least that I've seen. He's wearing a nice Greenwich armour, too.